Keep complimentary foods in one place with Bruce Larrabee's handmade piece. A single plate is just asking for side and main dish course collision, but keep sauce and dip dishes separate and you're risking table spillage. 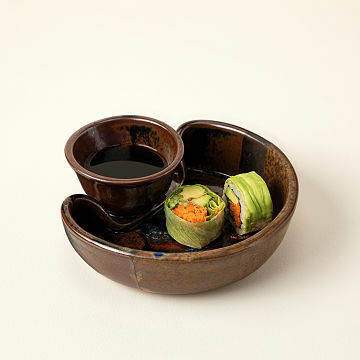 With Bruce Larrabee's handmade piece, you'll keep complimentary foods together but separate for optimal dipping control. Not only is the duo incredibly functional, but it also features Bruce's unique drip glazing technique, making it a bold, beautiful accent in your serveware collection. Each piece is hand-thrown, fired in a kiln at 2,400 degrees, glazed, and shipped to you just in time for your next dinner party. Handmade in Park City. 7.5" L x 7.25" W x 2.5" H; 4 fl. oz. capacity; 1 lb. Makes a snack a special occasion. Eating in art, how fun!